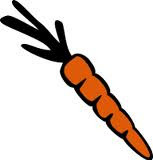 Bunny's Chewin' The Carrot: Blogging is interesting. I've been checking out a few blogs that seem to be linked together via a blog called Richard's Bass Bag. There are some blogs with some fairly unusual names like Man of Errors, The Pink Paddler, Nicola's Supermarket Bag, Robert's Platforn, The Wine Guy, 'How the hell does this work? ', The The The Guy, The Confusion Chronicles, and so on. On Richard's Bass Bag the other blogs are often linked by different names (Robert's Platform appears as Second Fiddle) and some carry the add on of (of RBB). This sounds like some sort of recommendation or title. On blog, The Curmudgeon, has a link name of Comeinyourpants. That's a little strange. Richard's Bass Bag often has posts about music. It appears that he plays the double bass. I'll check out the site some more. Second fiddle was my first blog. Where do you live? Taita. Why was it called Second Fiddle?